The political climate has changed so much that rather than updating my post, Smart Grid Stimulus, it is time to start a new one. If the level of federal subsidies given to clean tech enterprises takes a precipitous fall then it will also bring down some of tomorrow’s companies. Despite this recent success, however, nearly all clean tech segments in the United States remain reliant on production and deployment subsidies or other supportive policies to gain an expanding foothold in today’s energy markets. Now, many of these subsidies and policies are poised to expire—with substantial implications for the clean tech industry. Reinvestment Act of 2009 (ARRA) is now coming to an end, coinciding with the expiration of several additional time-delimited tax credits and programs. As a result, key portions of the clean tech industry can now anticipate substantially reduced federal support. Even excluding ARRA funds, a sharp decline in federal support for clean tech sectors is evident, with normal, non-ARRA annual clean tech funding scheduled to decline by more than half, from a peak of $24.3 billion in 2010 to $10.9 billion by 2014. Tax preferences—such as special deductions, special tax rates, tax credits, and grants in lieu of tax credits—which totaled $20.5 billion, or about 85 percent of the total. The Department of Energy’s spending programs, which received funding totaling $3.5 billion, or about 15 percent of the total. Four provisions expired at the end of December 2011; together those provisions accounted for a little over $12 billion, or 60 percent, of the budgetary impact in 2011 of the energy-related tax preferences. 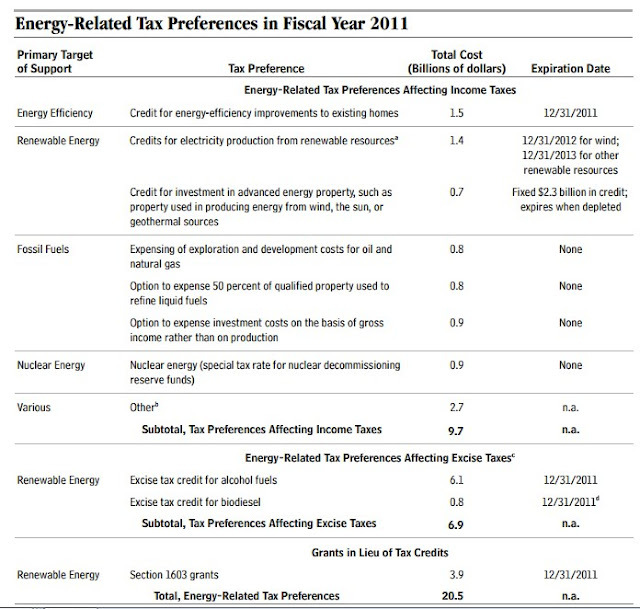 One expired provision—a renewable energy tax credit for the use of alcohol fuels—accounted for about half that amount. Another expired provision—a credit for energy efficiency improvements to existing homes—cost $1.5 billion and was the only tax preference that provided support for energy efficiency improvements. Only four of the major tax preferences are permanent, three of which are directed toward fossil fuels and one which is directed towards nuclear energy. Those four cost about $3.4 billion in 2011. The Department of Energy supports energy technologies through direct investments (primarily for research and development, or R&D) and by providing loans or loan guarantees. That support has varied over time, but, with the exception of the substantial funding provided in ARRA, it has generally declined in recent years—from $10 billion (in 2011 dollars) in 1980 to $3.5 billion in 2011 and $3.4 billion in 2012. More than half of that support in both 2011 and 2012 was directed toward energy efficiency and renewable energy. DOE received roughly $10 billion in 2009 to cover the net cost to the government of its subsidized credit programs but has received only limited additional subsidy funding for those programs since then: $170 million in 2011 and no new funding in either 2010 or 2012. Between 2009 and 2012, DOE provided an estimated $4.0 billion in subsidies for about $25 billion in loans, primarily to producers of advanced vehicles, generators of solar power, and manufacturers of solar equipment. Bloomberg New Energy Finance reported in April 2012 (PDF) that global clean energy investment fell to $27 billion in the first three months of 2012, down 28 percent from the previous quarter and down 22 percent from the first quarter of 2011. It’s the worst showing since the first quarter of 2009, when the research firm counted $20 billion in venture capital, private equity, public markets and asset finance. IPO activity took a particularly poor turn, with only $601 million raised on the public markets in the quarter. The two biggest IPOs of the quarter were the $74.8 million debut of Ceres, maker of genetically-modified energy crops, and the $68.8 million public launch of biodiesel maker Renewable Energy Group. In the meantime, we’ve seen a host of companies delay or cancel their IPO plans amidst ongoing market turmoil and falling prices for publicly listed green technology companies. While solar microinverter maker Enphase raised $54 million in its IPO last week, it also reduced its initial share price by nearly half beforehand. And this morning, massive solar thermal power startup BrightSource suspended its IPO plans after a year of waiting for market conditions to improve. ARPA -Advanced Research Projects Agency-Energy - Funds small groups of researchers, engineers, and entrepreneurs focused on translating technological breakthroughs into commercial products. EFRCs - Energy Frontier Research Centers - Funds small, collaborative groups of researchers around the country working to create scientific breakthroughs that may unlock new pathways to overcome key engineering obstacles blocking clean energy development. Energy Innovation Hubs - Integrated research centers sponsored by the DOE that combine basic and applied research with engineering to accelerate scientific discovery in critical energy issue areas. In 2010, the first Energy Innovation Hubs began operations with some of the top scientists from academia, industry, and government charged to collaborate and overcome known barriers in energy technology. The first three hubs focused on how to build more-efficient nuclear reactors, design more energy efficient buildings, and produce biofuel from the sun. Together the five hubs will shorten the path from laboratory innovation to technological development, and lead the way toward American competitiveness, economic growth and energy security. CASL - Consortium for Advanced Simulation of Light Water Reactors - Uses supercomputers to create “virtual” reactors that will help improve the safety and performance of both existing and new nuclear reactors. The models produced will then help address significant operational and safety issues identified by the nuclear industry, like localized corrosion and cladding integrity during a loss of cooling accident. As a result, capital and operating costs per unit of energy can be reduced through improved efficiency. Efficiency upgrades could also mean enabling higher fuel burn-up, which would reduce the amount of nuclear waste left over. Eventually, the virtual modeling could even help nuclear engineers as they work develop the next generation of nuclear reactors. JCAP - Joint Center for Artificial Photosynthesis - Hopes to find a way to emulate the process of photosynthesis, the process by which plants turn light into energy. The goal of this hub is generating new liquid fuels using only materials that are plentiful - like sunlight, water, and carbon dioxide. This development would go a long way toward making solar fuels an accessible, reliable, and sustainable successor to petroleum-based fuels, reducing American dependence on foreign oil. JCAP is led by a team from the California Institute of Technology (Caltech) and brings together more than 120 scientists and engineers from Caltech and its lead partner, Lawrence Berkeley National Laboratory. JCAP also draws on the expertise and capabilities of key partners from Stanford University, the University of California campuses at Berkeley , Santa Barbara (UCSB), Irvine (UCI), and San Diego (UCSD), and the Stanford Linear Accelerator (SLAC). In addition, JCAP serves as a central hub for other solar fuels research teams across the United States, including 20 DOE Energy Frontier Research Center. The program has a budget of $122M over five years, subject to Congressional appropriation. The EEB Hub was established in Philadelphia by the U.S. Department of Energy was an Energy-Regional Innovation Cluster (E-RIC) on February 1, 2011 with a unique dual mission of improving energy efficiency in buildings—literally re-energizing them for the future—and promoting regional economic growth and job creation from our headquarters in Philadelphia's Navy Yard, one of the nation's largest and most dynamic redevelopment opportunities. Batteries and Energy Storage Hub will focus on accelerating research and development of electrochemical energy storage for transportation and the electric grid. In February 2012, the DOE announced plans to launch a new Energy Innovation Hub for advanced research on batteries and energy storage with an investment of up to $120 million over five years. The hub, which will be funded at up to $20 million in fiscal year 2012, will focus on accelerating research and development of electrochemical energy storage for transportation and the electric grid. The interdisciplinary research and development through the new Energy Innovation Hub will help advance cutting-edge energy storage and battery technologies that can be used to improve the reliability and the efficiency of the electrical grid, to better integrate clean, renewable energy technologies as part of the electrical system, and for use in electric and hybrid vehicles that will reduce the nation’s dependence on foreign oil. The full Funding Opportunity Announcement (FOA) is available HERE. Critical Materials Hub will primarily focus on enhancing the domestic supply of materials critical for energy technology systems and reducing the quantities of those materials necessary for manufacturing and deploying those systems. On May 31, 2012, the DOE announced it expects to invest up to $120 million over five years to launch a new Energy Innovation Hub to identify problems and develop solutions across the lifecycle of critical materials. The Hub will work to advance U.S. leadership in energy manufacturing – such as electric vehicles, wind turbines, efficient lighting and others – through research aimed both at having a reliable supply of rare earths and other critical materials, as well as finding efficiencies and alternatives that reduce the amount we actually need. Universities, national laboratories, nonprofit organizations and private firms are eligible to compete; selection is expected in Fall 2012. Loan Guarantees - These guarantees predated ARRA and are intended to reduce the risk exposure of lenders under the program and theoretically providing greater credit liquidity. Prior to ARRA, however, these benefits proved to be illusory, with the limitations of the program preventing even a single project from utilizing DOE loan guarantees. The prior program is described by Section 1703 of Title XVII of the Energy Policy Act of 2005 (“EPAct 2005”). Section 1703 authorizes the DOE to issue loan guarantees to eligible commercial projects that “avoid, reduce, or sequester air pollutants or anthropogenic emission of greenhouse gases” and “employ new or significantly improved technologies as compared to technologies in service in the United States at the same time the guarantee is issued. The first challenge raised by this program was the innovation requirement, which precluded the funding of mature technologies. Unfortunately, such maturity is a standard prerequisite for project finance. In addition, the 1703 program suffered from the credit subsidy cost requirement, which effectively required applicants to self-insure project risk by making an administrative fee payment to DOE to cover the risk of payment default or delinquency. Under ARRA, Congress invigorated the DOE loan-guarantee program by establishing a temporary program under Section 1705 that authorized DOE to make loan guarantees to certain renewable energy systems, electric transmission systems and leading-edge biofuels projects that commenced construction no later than Sept. 30, 2011. PTC - Production Tax Credit - Offered to the wind industry: The American Wind Energy Association says that wind power accounts for 35 percent of all new American electric generation in the last five years. It also provides 75,000 current jobs. But the tax credit that propelled such an expansion is set to expire at year-end, potentially eroding the industry’s future, it says. “Economic studies have shown that congressional inaction on the PTC will eliminate 37,000 American jobs, shutter plants and cancel billions of dollars in private investment,” says Denise Bode, executive director of the wind group, in a column she penned for Forbes. Section 1603 Grants - Treasury FAQ - Congress enacted ARRA Section 1603, the Treasury grant, as a way to expand the use of clean and renewable energy despite diminished investor demand for tax credits and the lack of credit availability. Pursuant to Section 1603, the U.S. Department of the Treasury reimburses eligible applicants for up to 30 percent of the capital expense for specified energy property. This cash grant is payable to the project within 60 days after it is placed in service. Due to the severity of the recession, Section 1603 was designed to be a rapid response with a short lifetime. To comply with Section 1603 requirements, a project must be placed in service or begin construction during 2009 or 2010. VEETC - The Volumetric Ethanol Excise Tax Credit - long benefiting corn-based ethanol producers expired at the end of 2011 and has not been renewed. Conventional ethanol producers are expected to weather the loss of their primary subsidy far better than other sectors, however, thanks to the relatively competitive price of ethanol relative to current oil prices66 and the ongoing presence of a national Renewable Fuels Standard. This market mandate requires the annual use of ethanol and other biofuels to steadily expand from 12.6 billion gallons in 2011 to 14.4 billion gallons in 2014. According to agricultural commodity analysts Advanced Economic Solutions, the removal of the VEETC will therefore result in “only a modest reduction in US ethanol production” as the current application of the VEETC only marginally increases total production above what the Renewable Fuels Standard mandates regardless. Advanced biofuels produced from inedible cellulosic material and other non-corn feedstocks face more substantial impacts from expiring federal supports. A subsidy generally worth $1.01 per gallon for cellulosic ethanol producers is scheduled to expire at the end of 2012, alongside a USDA Bioenergy Program supporting production of feedstocks for advanced biofuels. A temporary ARRA-supported program appropriated $800 million to support pilot- and demonstration-stage biorefineries for advanced biofuels, but all funds were expended by the end of 2009. Finally, a USDA Biorefinery Assistance Program created by the 2008 Farm Bill offers loan guarantees to cover a portion of the development, construction, or retrofitting costs of new, commercial-scale advanced biofuel refineries, yet new lending authority for this program expired in the spring of 2011. While the federal RFS creates demand for non-corn biofuels, fuel producers are only obligated to purchase advanced biofuels if they are available in sufficient quantities and at low enough prices. With public subsidy for next-generation biofuels approaching a nadir, the market outlook for this nascent sector appears highly uncertain. This is not the time to mourn, or celebrate. But it is the moment to rethink America’s energy policy and to more constructively channel its outlays. We need to accelerate technological progress and more effectively spending taxpayer resources. Cost competitiveness is achievable, but until technological innovation and cost declines can secure independence from ongoing subsidy, clean tech segments will remain continually imperiled by the threat of policy expiration and political uncertainty. Continual improvement in price and performance is thus the only real pathway beyond the cycle of clean tech boom and bust. Maintaining a viable US clean tech industry will require policy makers to reform the nation’s myriad energy subsidies, which should be optimized to drive improvements in technology price and performance and ensure clean tech segments achieve subsidy independence as rapidly as possible. Federal clean energy policies should reward firms for continually improving the performance and reducing the cost of their technologies, or for inventing and commercializing next-generation, advanced energy technologies, not simply for deploying current-generation technologies without advancing them towards subsidy independence. Energy subsidies should be temporary and targeted to drive the maturation and improvement of emerging technologies. Just as subsidies for clean tech sectors should phase out as these sectors mature, it is long-past time to end subsidies for well-established fossil energy production methods and technologies as well. US investment in clean energy research, development, and demonstration should be increased. 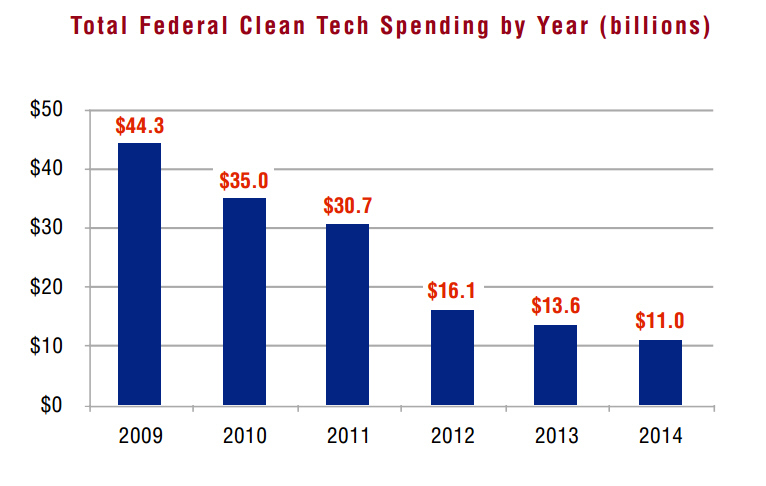 R&D constitutes roughly 18 percent of federal clean tech spending over 2009-2014. While energy RD&D funding is relatively stable over this period, it averages just $4.7 billion per year, roughly one-half to one-third the optimal funding levels recommended by numerous business leaders, researchers, and national science advisers and far lower than annual investments in other key national innovation priorities, such as space research and exploration ($19 billion), health research ($34 billion), and defense related research ($81 billion). Account for Externalites - Generally, households and businesses do not have a financial incentive to take into account the environmental damage or other such “external” costs to the nation as a whole that are associated with their decisions about energy production and consumption. The federal government’s intervention in energy markets can be beneficial if it leads to a more efficient use of resources than would result from the outcomes in a purely private market. Account for Spill Over Benefits - The amount of R&D that the private sector undertakes is likely to be inefficiently low from society’s perspective because firms cannot easily capture the “spillover benefits” for society as a whole that result from it. That is particularly true for R&D at the early stages of development. Such research can create fundamental knowledge that can lead to numerous benefits for society but not necessarily for the firms that funded that research; thus government funding can be beneficial. By contrast, DOE’s funding of energy technology demonstration projects at later stages in the development process has been far less cost-effective, and the Government Accountability Office, among others, has criticized DOE’s management of such projects. Level Long Term Playing Field - The reality is that in recent years the renewable sector has received the preponderance of the federal benefits being offered. But if viewed over decades, the combined support given to the fossil fuels is considerably more. In fact, President Obama likes to say that the government subsidies given to the natural gas drilling industry has allowed it to unlock the shale revolution -- a potential economic boom that could help the whole country. Energy Independence - The United States can leverage its strengths as an innovation leader and accelerate the pathway to clean tech subsidy independence by increasing funding for energy RD&D, accelerating advanced energy technology commercialization, and harnessing the advanced manufacturing capabilities, regional industry clusters, and high-skilled energy workforce that are crucial to a robust innovation system. International Competitiveness - Establishing subsidy independent, highly innovative US clean tech markets will also position US firms to compete effectively in growing international markets for clean energy products. With the right reforms, the United States has the opportunity to be a leader in the invention and production of next-generation technologies for sale to an energy-hungry global market. Energy Commodity Pricing - New industry sectors are often volatile, as innovative technology firms must challenge both established incumbents and competing upstarts. Clean tech sectors are no exception. Yet in energy, unlike biotechnology or information technology, price is king. Like steel or copper, energy is a commodity, principally valued not for its own qualities but for the services and products derived from it. As such, while new drugs, software, or consumer electronics command a price premium from customers by offering new value-added features and hence command a premium price from customers, new energy technologies must routinely compete on price alone, even if they offer other long-term benefits. It would be a difficult feat for any nascent technology to enter a commodity market and compete immediately on cost, but clean tech sectors face a particularly challenging rival: well-entrenched fossil fuel incumbents that have had more than a century to develop their supply chains and make incremental innovations to achieve high levels of efficiency. These mature fossil energy industries have long enjoyed sizable, stable flows of subsidy support as well as a regulatory environment and established infrastructure both geared towards fossil fuel models of energy procurement, delivery, and use. Subvert Free Markets - If the clean technologies were truly competitive then they would not need any preferences. Free markets, in fact, dictate that the businesses with the most creative and marketable ideas will win -- not the ones that are chosen by government bureaucracies. Buck World Trends - Western European nations that have given preferential treatment to their renewable energy sectors are cutting back. Germany, Italy, Spain and Great Britain are trying to balance their desires to cut carbon emissions and promote green energy growth against much tougher economic times. Tax Preferences are Inefficient - Despite the fact that tax preferences have accounted for a large share of federal support for energy, they are generally an inefficient way to reduce environmental and other external costs of energy. They often reward businesses for investments and actions they intended to take anyway. Also, they target only specific technologies, which may not be the least expensive technology. The most direct and cost-effective method to reduce external costs would be to levy a tax on energy sources that reflects the amount of such costs associated with their production and use. Stop and Go Funding Creates Market Uncertainty - The intermittent and haphazard nature of US energy policy also wreaks havoc with the business confidence necessary for the long-term investments required to develop new and improved products. The PTC for wind power, for example, was first enacted in 1992, but has since expired three times, and has been renewed a total of seven times, often with less than a month to spare before pending expiration . Other clean tech subsidies, including key tax credits for solar, biofuels, energy efficient products , and other segments have experienced similarly erratic expirations. The market effects are chilling , and many private firms are forced to focus principally on ramping-up production for subsidized markets while they last, rather than pioneering next-generation designs and manufacturing processes for the long-term. Inefficient Subsidies - Many of today’s clean energy subsidies are focused primarily on supporting the deployment of existing energy technologies at current prices, and most provide no clear pathway to subsidy independence. The federal renewable electricity PTC, for example, has provided the same level of subsidy to wind power and closed-loop biomass-fueled power plants since initial enactment in 1992 and to geothermal and other qualifying renewable electricity sources since 2004, when it was first extended to them. Subsidy levels increase each year at the rate of inflation, keeping per MWh subsidy levels constant in real dollar terms and providing no clear incentive for continual cost declines or pathway to eventual subsidy independence . Renewable portfolio standards require utilities to purchase a certain percentage of electricity generation from renewable sources, encourage deployment of the lowest-cost renewable energy technology available—generally wind power or biomass. But they do little to drive down the price of other, clean energy technologies, such as solar or advanced nuclear power designs, that may have higher costs now but hold the potential to become much cheaper in the long-run. Establish a Competitive Market - Deployment policies should create market opportunities for advanced clean energy technologies while fostering competition between technology firms. create market incentives and structures that demand and reward continual improvement in technology performance and cost. Provide Targeted and Temporary Support for Maturing Technologies - Deployment policies must not operate in perpetuity, but rather should be terminated if technology segments either fail to improve in price and performance or become competitive without subsidy. Reduce Subsidy Levels in Response to Changing Technoly Costs - Deployment incentives should decline as technologies improve in price and performance to both conserve limited taxpayer and consumer resources and provide clear incentives for continued technology improvement. Avoid Technology Lock-out and Promote a Diverse Energy Portfolio - Deployment incentives should be structured to create market opportunities for energy technologies at different levels of maturity, including new market entrants, to ensure that each has a chance to mature while allowing technologies of similar maturity levels to compete amongst themselves. Provide Sufficient Business Certainty - While deployment incentives should be temporary, they must still provide sufficient certainty to support key business decisions by private firms and investors. Maximize the Impact of Taxpayer Resources and Provide Read Access to Affordable Private Capital - Deployment incentives should be designed to avoid creating unnecessarily high transaction costs while opening up clean tech investment to broader private capital markets. The DOE’s Loan Programs Office, which funded Solyndra, should be replaced by a more flexible, independent, and sophisticated suite of financial tools and other mechanisms designed to draw private capital into cleantech projects through a variety of investment, credit, securitization, insurance , and standardization activities. Whether delivered through a Clean Energy Deployment Administration (CEDA) or other entities or programs, the clear mission of these activities would be to accelerate the commercialization and deployment of critical advanced energy technologies. A National Clean Energy Testbeds program (N-CET) should be established to take advantage of public lands to accelerate technology demonstration and commercialization. This new program would provide access to pre-approved, monitored, and grid-connected public lands and waters ideal for demonstration of innovative energy technologies, thereby reducing the cost, time, and permitting challenges associated with technology commercialization. The power of military procurement should also be leveraged to drive demanding early markets for advanced energy technologies that meet tactical and strategic military needs and may have later commercial applications.16 Energy technologies with dual-use military and commercial potential include advanced vehicle technologies, aviation biofuels, advanced solar power, improved batteries, and small modular nuclear reactors. In July 2013, the Environment America Research & Policy Center released its ranking of the top 12 solar states in the country. Per capita, the top 12 solar states are: Arizona, Nevada, Hawaii New Jersey, New Mexico, California, Delaware, Colorado, Vermont, Massachusetts, North Carolina and Maryland. While these 12 states account for only 28 percent of the U.S. population, they make up 85 percent of the nation's installed solar energy, leading due to state and local governments that have created effective public policy for the development of solar. For example, according to the research, 11 of the 12 leading states have net metering policies, which allow customers to offset their electric bills with onsite solar and receive reliable and fair compensation for the excess electricity they provide to the grid. Second, 11 of the 12 states have renewable electricity standards, requiring utilities to provide a minimum amount of their power from renewable sources, nine with solar carve outs, which set specific targets for solar or other forms of clean onsite power. Next, 10 of the 12 have statewide interconnection policies which reduce the time and effort required for individuals and companies to connect solar energy systems to the grid. Finally, the majority of the top solar states allow for creative financing options such as third-party power purchase agreements and property assessed clean energy (PACE) financing.